The basic and clinical research activities of the Freeman Laboratory focus on the eukaryotic cell production, reactions and signal transduction properties of oxidizing and free radical inflammatory mediators (e.g., superoxide, hydrogen peroxide, nitric oxide (NO), peroxynitrite, nitrogen dioxide, oxidized/nitrated lipids). In particular, we are interested in the action of these species as both redox signaling mediators under basal conditions and as pathogenic agents in inflammatory diseases. Our observations regarding O2 and NO-derived reactive species have lent new insight into redox-dependent cell signaling and have revealed new therapeutic strategies for treating acute inflammation, metabolic syndrome, respiratory disorders and cardiovascular diseases. In the late 1980s, his group studied the cellular and subcellular organelle production of superoxide and hydrogen peroxide. Following the landmark description of endothelial-derived relaxing factor (EDRF) as the free radical NO, the Freeman laboratory pioneered the concept that the inflammatory and signal transduction mediator NO displays unique redox signaling actions following reaction with superoxide, oxidizing fatty acids and heme peroxidases. The “oxidative inactivation” of NO is a kinetically fast reaction, yielding “reactive nitrogen species” as products. This array of reactions of O2-derived species with NO can serve to both impair and transduce NO signaling via non-cGMP dependent mechanisms. There is now a rapidly expanding appreciation that NO-derived reactive species display distinct chemical reactivities and exert cell signaling actions beyond the activation of guanylate cyclase – e.g., via thiol oxidation, electrophilic addition and receptor-dependent reactions. 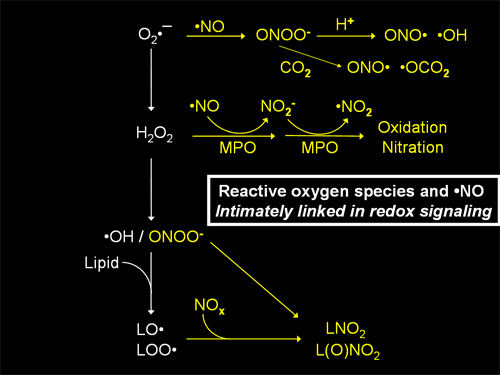 This aspect of redox-related chemical biology is an area that the Freeman laboratory continues to investigate, with the intent of defining the linkages between reactive oxygen species and NO-dependent cell signaling mechanisms. From a translational research perspective, his group is addressing how these interactions impact cell and organ function, with particular directed towards metabolic, cardiovascular and pulmonary diseases. 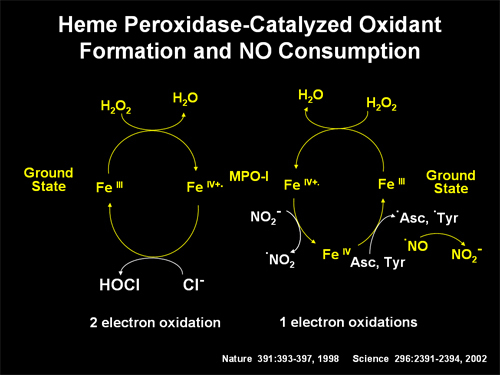 Dr. Freeman's laboratory observed that NO reacts with superoxide (O2-) to yield the potent biological oxidizing and nitrating species peroxynitrite (ONOO-)and its conjugate acid, peroxynitrous acid (ONOOH). Groundbreaking observations were made in this area by Joe Beckman, PhD and Rafael Radi, MD, PhD. Their work showed that peroxynitrite is both a direct oxidant and, after homolytic scission of peroxynitrous acid, yields the potent oxidant hydroxyl radical (OH) and the oxidizing and nitrating species nitrogen dioxide (NO2) (Fig. 1). Also, they identified thiols and carbon dioxide as the principal biological targets of peroxynitrite. It is now known that peroxynitrite accounts for many of the pathogenic actions previously ascribed to its precursors - superoxide (and its products) and NO. Work from many laboratories continues to affirm that peroxynitrite mediates redox cell signaling actions upon the oxidation or nitration of target molecules such as thiols, aromatic amino acids, nucleotides and unsaturated fatty acids – with downstream cell signaling events and reactions of peroxynitrite now appreciated to be a consequence of its potent and unique reactivities. An observation from the Freeman laboratory, related to peroxynitrite biochemistry and pharmacology, has yielded new insight into biochemical and tissue responses to ischemia. Specifically, the CO2 accumulation that occurs during impaired tissue perfusion and oxygen delivery displays potent pro-inflammatory properties. Observations made by Dr. Radi showed that carbon dioxide indirectly affects the reactivity of O2-and NO, via its facile chemical reaction with the superoxide and NO reaction product, peroxynitrite. This reaction yields the potent oxidizing and nitrating species nitrosoperoxocarbonate (ONOOCO2) that in turn yields secondary radical species (Fig. 2). John Lang, MD then discovered in an animal model of sepsis that there is a potent contribution of CO2 to tissue redox signaling and inflammatory responses. For example, clinically-relevant mechanical ventilation strategies performed on anesthetized rabbits reveals that mild hypercapnia amplifies inflammatory lung injury. Of interest, this also causes a CO2-dependent increase in iNOS gene/protein expression and NO/ONOO- production. The discovery that CO2 actively participates in oxidative inflammatory reactions has relevance to ICU-related care and organ transplantation. Figure 2. The chemical reactivities and cell signaling actions of reactive oxygen species and nitric oxide are intimately linked. Figure 3. The PMN-dependent release of MPO results in subendothelial deposition and the generation and reaction of secondary NO-consuming, oxidizing and nitrating species. Studies with wild type and MPO-/- mice undergoing an acute inflammatory response provided another important insight into the actions of MPO during NO signaling. Specifically, reactions catalyzed by MPO directly modulate vascular relaxation and inflammatory responses by regulating NO bioavailability. In addition to directly reacting with NO (a kinetically slow reaction), MPO predominantly alters vascular responsiveness by generating substrate radicals (such as tyrosyl radical and ascorbyl radical) that rapidly consume NO and abrogate its cGMP-dependent signaling capabilities. Thus, multiple reactions of MPO lead to biomolecule nitration and NO consumption. Figure 4. MPO oxidizes nitrite to nitrogen dioxide and catalytically consumes NO. Of important clinical relevance, Drs. Margaret Tarpey and Stephan Baldus have discovered that enzymatic reactions leading to the catalytic consumption of NO impair vascular function and are linked with increased risk for an adverse myocardial event (heart attack or death) in patients. 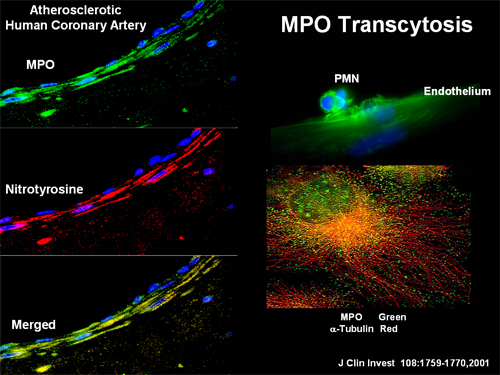 The main perpetrators of oxidative NO consumption in the vasculature appear to be the reactive species derived from xanthine oxidoreductase (XO) and MPO, with both plasma XO and MPO levels elevated in patients with coronary artery disease. The work of others also suggest that a variety of NA(D)PH oxidases act in a similar manner. As for MPO, XO readily binds to and enters the vessel wall, with this occurring to a much greater extent in patients with coronary artery disease (Fig. 5). Work by Dr. Baldus convincingly shows that both coronary blood flow and the risk for adverse myocardial events are strongly linked with plasma MPO levels in patients. 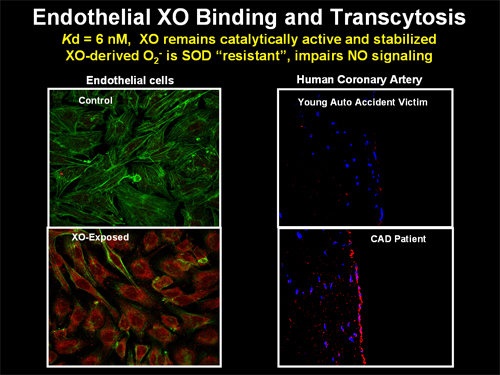 More recently, it has been observed that XO also contributes to impaired coronary vasomotion in patients. Figure 5. Xanthine oxidase readily binds to and is incorporated by vascular cells. In coronary artery disease patients XO accumulates along the vessels wall and catalytically consumes NO. 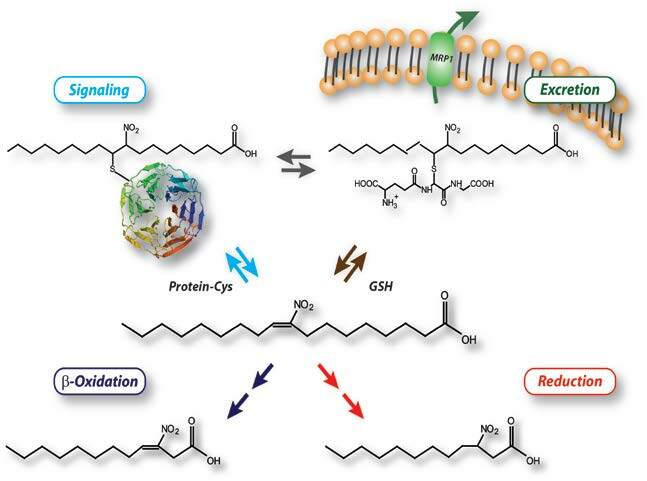 Dr. Freeman's group is presently actively investigating the pluripotent signaling actions of the NO-derived, nitrated unsaturated fatty acids formed during enzymatic and autocatalytic lipid oxygenation (Fig 6). Homero Rubbo, PhD discovered that NO potently inhibits fatty acid oxidation, via reactions that are >2000 times faster than similar events catalyzed by vitamin E. Dr. Rubbo also observed at the same time that NO-dependent reactions induce fatty acid nitration. Building on this observation, Valerie O’Donnell, PhD lent important structural and functional insight into these endogenously-present species, and how they can be formed biologically. Figure 6. A spectrum of nitrated fatty acids are produced by NO and nitrite-dependent oxidative inflammatory reactions. Nitro-fatty acids are present under physiological and pathological conditions in a broad range of species, including insects, fish (e.g., salmon), plants (e.g., olives) and humans. The consumption of diets promoting increased tissue and plasma nitro-fatty acid levels has recently been proposed to account for a significant element of the health benefits linked with Mediterranean and Japanese-like diets. The use of high performance liquid chromatography techniques coupled with high accuracy mass spectrometry analysis has given precise structural and conformational characterization of these species. As a result, pure preparations of synthetic nitro-fatty acids are structurally identical to those found endogenously in humans at nM to sometimes mM concentrations. 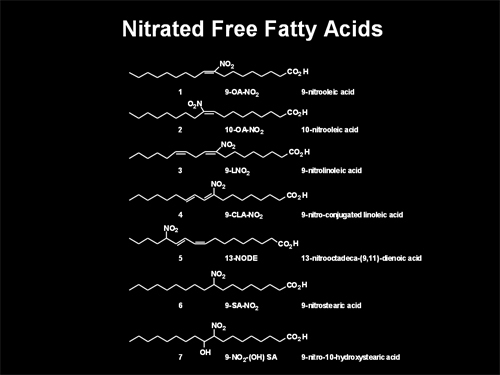 Acid-catalyzed unsaturated fatty acid nitration by dietary nitrite coming from vegetables and cured meats. Free radical-mediated fatty acid nitration reactions during digestion, metabolic stress and inflammatory conditions. These reaction mechanisms support the formation of nitrogen dioxide (NO2) which rapidly reacts with unsaturated double bonds in fatty acids, giving rise to the formation of nitro-fatty acid derivatives. These products contain a reactive center that interacts with critical protein targets and induces post-translational protein modifications. Somewhat akin to protein phosphorylation or dephosphorylation, nitro-fatty acids transiently alter the function of key target proteins to modulate the activity of critical gene expression programs, enzymatic activities and signaling network activities – thereby inducing characteristic anti-inflammatory, anti-fibrotic and cytoprotective actions. Nitro-fatty acid metabolism and clearance - The formation of reversible adducts between target proteins and nitro-fatty acids results from the “soft” electrophilic nature of nitro-fatty acids. This chemical property is also the basis for nitro-fatty acid reaction with glutathione (GSH), which helps regulate nitro-fatty acid levels. Products of GSH and nitro-fatty acid reaction are exported from the cell to the circulation, where these adducts are filtered by the kidneys and excreted in urine, where nitro-fatty acid levels can be easily detected by mass spectrometry analysis. Nitro-fatty acids are also irreversibly inactivated by the enzyme prostaglandin reductase-1. Finally, like all fatty acids, nitro-fatty acids are metabolized by the mitochondrial energy-generating process termed beta-oxidation. These pathways all modulate the activity and half-life of both endogenous and exogenous nitro-fatty acids. Importantly, all critical protein adducts, gene expression events and metabolic products can be monitored in accessible tissue compartments, the plasma and urine of humans and animal models, thereby providing real-time insight into the metabolism and actions of nitro-fatty acids. Figure 9. Metabolism of nitro-fatty acids. Nitro-fatty acids such as nitro-oleic acid or nitro-linoleic acid react with cysteine residues in proteins to modify enzymatic activity and regulate transcription factor function and downstream gene expression. Similarly, the reaction of or transfer of a nitro-fatty acid to GSH reverses protein-nitro-fatty acid adduct formation and facilitates export from the cell to eventual urinary excretion. These species also undergo beta-oxidation reactions and are inactivated by prostaglandin reductase-1. Biological systems are endowed with an arsenal of sentinel proteins that constantly sense and react to changes in the cellular environment, in order to ensure the continued function of critical life-sustaining processes over a wide range of pathophysiological scenarios. In this regard, the detection of an invading pathogen or a toxin is met by the activation of pro-inflammatory cascades aimed at neutralizing the threat. The excessive or chronic activation of these physiological pathways can, if left unchecked, result in further damage to organs and tissues and the development of disease. Cells rely on the generation of adaptive signaling mediators that dynamically modulate the extent and duration of inflammatory and metabolic responses to external insults. Nitro-fatty acids were discovered to be a novel family of adaptive signaling mediators that pleiotropically down-regulate inflammation, activate protective cellular responses and induce endogenous production of antioxidant defenses in cells. 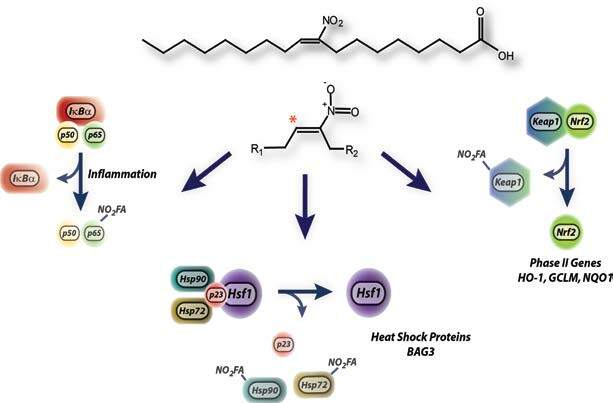 Specifically, nitro-fatty acids reversibly react with electrophile-susceptible transcription factors and protein thiols to modulate gene expression and enzyme activities via the post-translational modification of functionally-significant proteins. This ability of nitro-fatty acids to reversibly adduct proteins is at the root of their potent signaling actions and apparent lack of toxicity. For example, the pro-inflammatory actions of bacterial lipopolysaccharides (LPS) are inhibited by nitro-fatty acid adduction of the NFkB p65 subunit that undergoes DNA binding and mediates the stimulation of pro-inflammatory gene expression. Additionally, nitro-fatty acid reaction with critical cysteines in Keap1 results in the nuclear translocation of the transcription factor Nrf2 leading to increased generation of antioxidant and cytoprotective proteins by the cell. Accumulating evidence from multiple international research groups support that these cytoprotective activities of nitro-fatty acids can be harnessed for the development of effective therapies for the treatment of inflammatory and metabolic diseases. Notably, the concentrations of nitro-fatty acids that exert potent protective actions in murine models of disease (obesity-induced diabetes, restenosis, atherosclerosis, inflammatory bowel disease, pulmonary hypertension, acute and chronic renal injury, etc.) are in the 5-25 nM range, well within a pharmacologically attainable and safe range in humans. Figure 10. Signaling pathways modulated by nitro-fatty acids. This includes the suppression of pro-inflammatory gene expression by NFkB inhibition; induction of the expression of heat shock proteins; and upregulation of antioxidant defenses by the induction of Nrf2-regulated gene expression. Wendell SG, F Golin-Bisello, S Wenzel, RW Sobol, F Holguin and BA Freeman. 15-hydroxy-prostaglandin dehydrogenase generation of electrophilic lipid signaling mediators from hydroxy Ω-3 fatty acids. J Biol Chem 290:5868-5880, 2015. Woodcock SR, SR Salvatore, G Bonacci, FJ Schopfer and BA Freeman. Biomimetic nitration of conjugated linoleic acid: Formation, characterization and synthesis of naturally occurring conjugated nitrodienes. J Org Chem 79:25-33, 2014. Charles RL, O Rudyk, O Prysyazhna, A Kamyina, J Yang, C Morisseau, BD Hammock, BA Freeman and P Eaton. Protection from hypertension in mice by the Mediterranean diet is mediated by nitro fatty acid inhibition of soluble epoxide hydrolase. Proc Nat Acad Sci 111:8167-8172, 2014. Rudolph V, TK Rudolph, FJ Schopfer, G Bonacci, SR Woodcock, MP Cole, PRS Baker, R Ramani and BA Freeman. Endogenous generation and protective effects of nitro-fatty acids in a murine model of focal cardiac ischaemia and reperfusion. Cardiovascular Research 85:155-166, 2010. Groeger AL, C Cipollina, MP Cole, SR Woodcock, G Bonacci, TK Rudolph, V Rudolph, BA Freeman and FJ Schopfer. Cyclooxygenase-2 generates anti-inflammatory mediators from omega-3 fatty acids. Nature Chemical Biology 6:433-441, 2010. Batthyany C, FJ Schopfer, PR Baker, R Duran, LM Baker, Y Huang, C Cervenansky, BP Branchaud and BA Freeman. Reversible post-translational modification of proteins by nitrated fatty acids in vivo. J Biol Chem 281: 20450-20463, 2006. Schopfer F, Y Lin, P Baker, T Cui, M Garcia-Barrio, J Zhang, K Chen, Y Chen and BA Freeman. Nitrolinoleic acid – an endogenous PPARγ ligand. Proc Nat Acad Sci 102:2340-2345, 2005. Eiserich JP, S Baldus, M-L Brennan, W Ma, C Zhang, A Tousson, L Castro, AJ Lusis, CR White and BA Freeman. Myeloperoxidase: A leukocyte-derived vascular ·NO oxidase. Science 296:2391-2394, 2002. Eiserich JP*, M Hristova, CE Cross, AD Jones, BA Freeman, B Halliwell and A van der Vliet*. Formation of nitric oxide-derived inflammatory oxidants by myeloperoxidase in neutrophils. Nature 391:393-397, 1998. *PhD students. Rubbo H, R Radi, M Trujillo, R Telleri, B Kalyanaraman, S Barnes, M Kirk and BA Freeman. Nitric oxide regulation of superoxide and peroxynitrite-dependent lipid peroxidation: Formation of novel nitrogen-containing oxidized lipid derivatives. J Biol Chem 265:26066-26075, 1994. Radi R, JS Beckman and BA Freeman. Peroxynitrite oxidation of sulfhydryls: The cytotoxic potential of endothelial-derived superoxide and nitric oxide. J Biol Chem 266:4244-4250, 1991. Beckman JS, TW Beckman, J Chen, PA Marshall and BA Freeman. 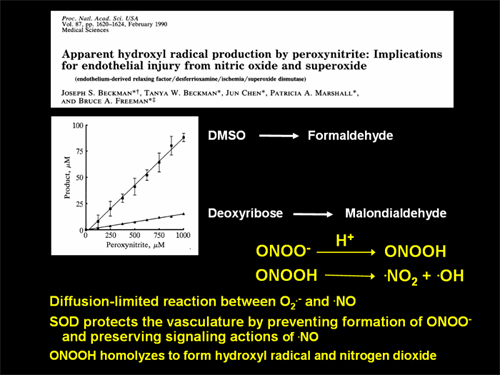 Apparent hydroxyl radical production by peroxynitrite: Implications for endothelial injury from nitric oxide and superoxide. Proc Natl Acad Sci 87:1620-1624, 1990. Rosen GR and BA Freeman. Detection of superoxide in endothelial cells. Proc Natl Acad Sci 81:7269-7273, 1984.